Too low scoring. As a baseball fan I do enjoy the occasional pitcher’s duel, but most Major League games average over 4 runs per team per game. With soccer it is ridiculous, it is always a defensive battle. The solution is three balls in play at the same time. Better two white balls and one red ball, with the red worth three points instead of one! Not only will this increase the scoring, but it will increase the number of breaks in the game, this will allow more beer commercials to be shown. Too many ties. North Americans do not like vaguery, we want a clear winner and loser especially in a once every four years competition. It really get crazy in the bracket rounds of the World Cup when after a brief overtime, they go to penalty kicks. This would be like a baseball game ending in a tie after 12 innings and then deciding the winner by playing home run derby. Nonsense! I would like to see them keep playing until they fall down from exhaustion except for the goalies. How cool would that be? Goalie on goalie until one of the scores! Of course, adoption my three ball proposal would also help reduce the number of ties. The clock is not the clock. Again, this is a problem with vaguery. I mean really, only the referee knows when the game is going to actually end. I know they have added the approximate extra time, but still, it is way too arbitrary. Technology must exist to allow the referee to add this time exactly onto the clock. Oh, by the way, the time runs in the wrong direction. We want it to count down, not up. This ain’t track and field! This one is specific to this World Cup – vuvuzelas. Sorry, they are worse then the insidious thundersticks that occasionally make their way into various North American events. The worst offense being the 2002 World Series between the Los Angeles Angels of Anaheim and the San Francisco Giants. There has got to be a way to filter this sound out of the feeds. I am so opposed to billing by the time unit, that I refuse to pay the $0.50 for those two minute mechanical rides to nowhere near shopping centers. In this video, you see how my kids completely enjoy themselves (effectiveness) even though the ride never moves at all (not efficient), plus I don’t pay anything! As an added bonus they make their own sounds and it qualifies as creative play! or Why my lovely wife does not want me to go shopping with her. At a recent trip to the mall, the whole family wondered into an Ann Taylor Loft. Actually, Christine wandered in, I just obediently followed. While she was looking around, I noticed three signs above adjacent racks. Any thoughts as to why? I have an idea, but will hold off posting it for a few days. You should have seen her face when I was taking these pictures. The salespeople at the store were a little perplexed as well. Photosynth is a pretty cool technology from Microsoft. (Actually, I think they bought from someone.) It allows you to stitch digital photos together. You can do full 360 degree views of a room or object. Pretty cool! I took these from our hotel window during my trip with my son, Sean, and father-in-law to St. Louis to see the Cardinals play the Brewers. Hat tip to John Shaver of Aries Technology for sending me this cartoon from this past Sunday’s Lio. I have used this analogy for years – implementing a new ERP, CRM or HR system at an organization is akin to a human being undergoing triple bypass surgery. No one is going to do it because it is on sale this month or even free. Price is not the issue. Recently, this has become a much more personal example for me as my Dad has had this procedure (the bypass, not an ERP implementation). I can say with certainty, if his highly skilled surgeon had offered to operate on me in a father/son two-for-one monthly special, I would have vigorously declined his offer. Price was not the issue. The next time you are working with a prospect who in interested in ERP/CRM/HR. Remember this. Price will not be the issue. In addition to the blood pressure pills I take from stressing out over changing the business model for professional firms (kidding, it is hereditary), I take a few vitamins and supplements on a daily basis. Since I like to take them on a full stomach, after dinner seems to work best for me. However, because I am usually doing several things at once I sometimes forget if I have taken the pills or not. 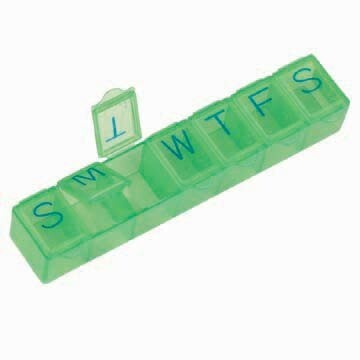 After debating about it for a few weeks, I finally broke down and bought one of those weekly pill organizers. (Shown at left.) OK, before you start with the comments, there were not many choices. In any case (pun intended), I loaded it up on Sunday and thus far it is working flawlessly. Coincidently, it has also led to an unintended benefit – I only have to unscrew the child protection lids once a week now, and not once a day. I got to thinking about it and there is a lesson here for professional firms. Notice that the original problem was one of effectiveness – I could not remember if I had taken the pills. In solving the effectiveness problem I also increase my efficiency – I only open the bottles once a week now. It was through increasing my effectiveness that I also increased my efficiency. I submit that this could not have worked the other way. No amount of increasing my efficiency of the original task would have increased my effectiveness. If I have lined up the bottles and practiced open them with the least amount of effort and streamlined precision of motion, I would have not increased my ability to remember to take the pills each night. The lesson – I am living proof of Kless’ Second Law – Effectiveness always and everywhere trumps efficiency. Today, we received our 2009/2010 Allen Community PhoneBook (the book formerly know as the Yellow Pages). With the proliferation of Google and the Web, these books usually make a 10 second trek through the house and land directly in the recycle bin. This one, however, had a advertisement from Al the Plumber. I can’t vouch for his work, but I sure like his pricing practices. My thinks to Christine, my wife, for pointing this out. In fact, I have not yet actually seen this in person. I plan on tearing off the cover and depositing the rest of the book in the green bin.